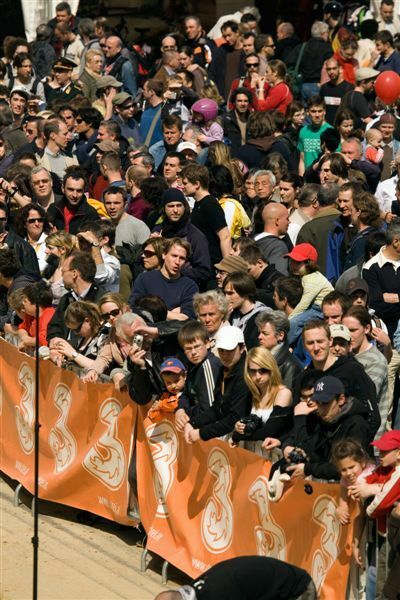 Noch eine Pressemitteilung aus dem Hause Rasoulution.com: Young gun Sam Pilgrim wins Vienna Air King 2008, Benny Korthaus pulls 360-Double Tailwhip. 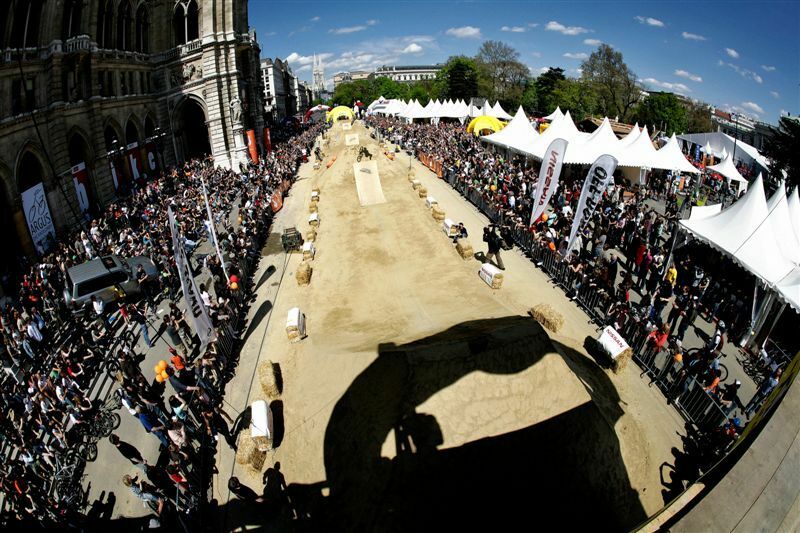 Vienna April 20th – The third anniversary of the Vienna Air King was peppered with a lot of surprises: seventeen years old Sam Pilgrim from Colchester, United Kingdom, proved his enormous potential placing first in the finals. Specialized rider Benny Korthaus was the first rider ever to pull off a clean 360- Double Tailwhip during an international mountain bike competition. The weekend started on Friday afternoon with the first training session in front of the picturesque Vienna City Hall. By Saturday’s midday the 45 riders from thirteen nations got used to the jumps, which consisted of a decent start drop from the eight meters high starting tower followed by three big sized doubles. The competitors had not only to cope with the technical challenging roller between the last two jumps, but with the fast changing wind conditions during the qualifications. Compared to last year’s Vienna Air King the riding level definitely went up: Benny Korthaus (GER) stoked the judges with clean runs including a Backflip on the first double as well as 360-Tailwhips and one handed 360 Tabletops. Yannick Granieri’s (FRA) really high Backflips and Sam Pilgrim’s clean riding style including 360-Tabletops secured their way into the finals on Sunday. 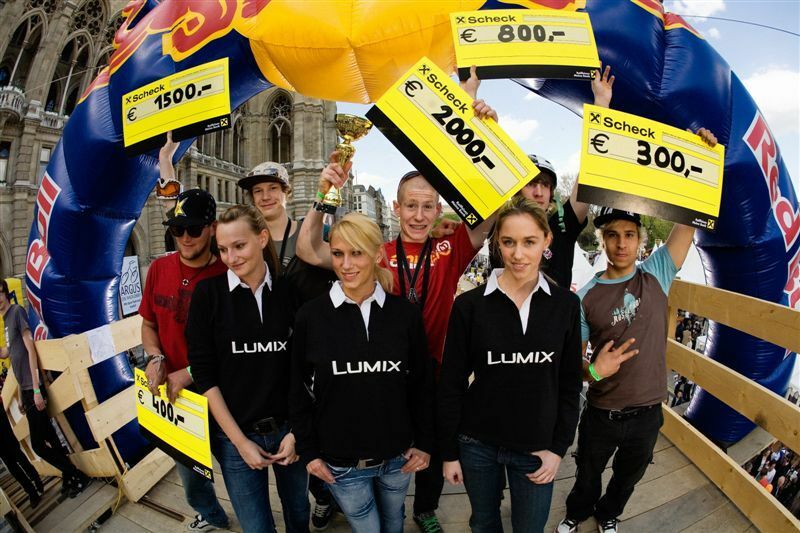 The highlight on Saturday, the PANASONIC-Best-Trick-Competition, marked the ending of Vienna Air King’s first contest day. The Top 5 of the qualifying: Martin Soederstroem (SWE), Yannick Granieri, Bartek Obukowicz (POL), Sam Pilgrim (UK) and Benny Korthaus (GER) made the numerous visitors of the Argus Bike Festival yelling for more. The best trick competition was dominated by Benny Korthaus and Sam Pilgrim in the end. Both were not able to pull their tricks clean till their last attempts which could just be described as perfectly exectued: Benny Korthaus’s 360-Double Tailwhip demolished the other five riders’ performance, including Sam Pilgrim’s Backflip Superman. The awards of the PANASONIC-Best-Trick-Competition were given out during the 10-Years-Anniversary party from the Mountainbike Revue Magazine. Apart from the prize giving, the party featured different peak levels including the European premiere of Kranked 7, a trial show, a live concert from Binder & Kriegelstein and a long party night, especially for the ones who didn’t make their way into the finals. Benny was not only happy to win 500 Euros, but a Panasonic 3-chip camcorder, so he will be able to get all his future traveling experiences taped in full HD. Three final runs, of which the best two counted, forced the riders to prove their consistence and trick variety on Sunday. Benny had some bad luck, showing a perfect first run, including a Backflip, 360-Table Top and 360-Tailwhip. The following two runs he had to fight the wind and loosing speed after a 360-drop from the starting tower. 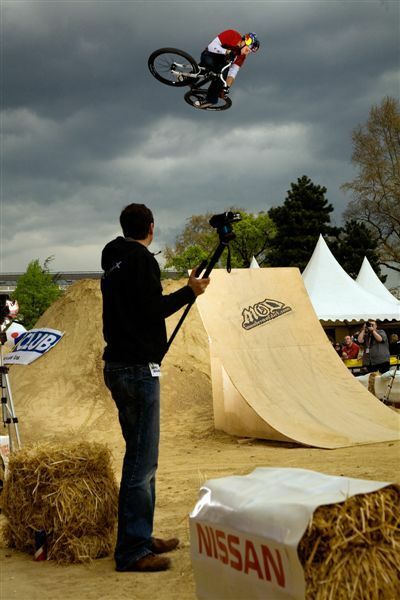 Yannick impressed the judges with the highest amplitude back-flipping the first double, being about three meters above the take off, followed by a No Foot Can Can and a 360. Norway’s well known freeriding export Trond Hansen placed fourth after pulling e.g. one run with a Tailwhip, 360-Table Top One Foot and a 360-opposite. The rookie Bartek from Poland made his way to the podium with a huge Backflip, Double Barspin and 360-Table Top. But the most ambitious battle was the fight between the two just 18 years old riders Martin Soederstroem and Sam Pilgrim: Martin dropping in with a 360, tail whipping the first double and ending his best run with a Tuck No Hand followed by a 360-Barspin to X-Up! Sam wasn’t willing to let the matter rest and gave his best in his last two runs pulling: a Backflip-X-Up One Foot, Superman Seatgrap and 360-Tailwhip. Martin would have won the finals with his best run, but with two runs counting, Sam showed more variety overall. One thing is for sure: the next generation of European dirt jump talents is not about to come – it can be stated that they are already a fixture in the international competitions. With over 70.000 visitors during the Argus Bike festival and about 6.000 people watching the Vienna Air King grand final – presented by Raiffeisen Club, Nissan, internet-provider “3” and Panasonic – this weekend proved itself as one of the most spectacular and well worth seeing seasons opening events in Europe. Be anxious for the Vienna Air King clip coming up this week to see all the action in moving pictures.